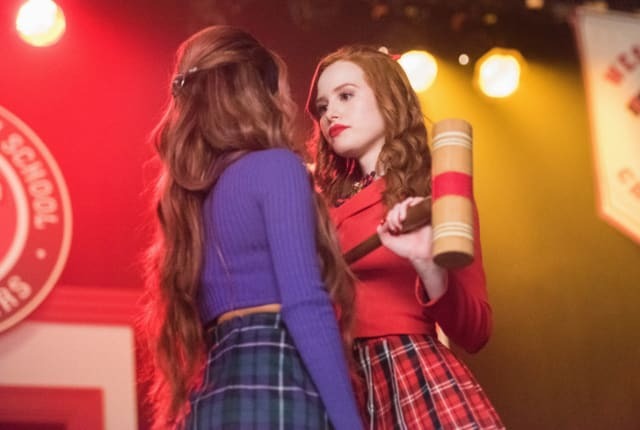 Watch Riverdale Season 3 Episode 16 online via TV Fanatic with over 1 options to watch the Riverdale S3E16 full episode. Affiliates with free and paid streaming include Amazon. On Riverdale Season 3 Episode 16, rehearsals go underway for the school's production of Heathers: The Musical, and Veronica learns some devastating news about her family. Betty: I know what you’re up to. Evelyn: Lowering Sweet Pea’s solo? Betty: Cute. This entire musical is just one big recruitment drive for you, isn’t it? Evelyn: I’m sorry, I don’t follow. Betty: The Farm is sponsoring the play. You strong-armed your way into co-directing, your warm up sermons, exercising trauma through art … screams cult recruitment! Evelyn: Betty, dissect these trust issues. Evelyn: The Farm is producing and I’m co-directing for one simple reason: to have BIG FUN. Permalink: The Farm is producing and I’m co-directing for one simple reason: to have BIG FUN. Riverdale Round Table: Was The Heathers Musical Episode Big Fun?